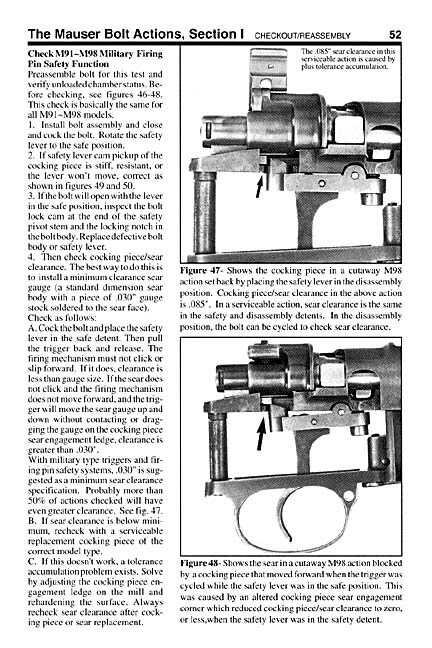 The only really detailed gunsmithing and repair manual on these superb actions ever printed. 100's of crystal clear photos and illustrations. Click here for a sample page from the book. Covers troubleshooting & problem solving (including the cause of and remedy for safety-off fires); parts identification and inspection; parts fitting and replacement; complete repair; trigger work; rebarreling and chambering; magnum conversions; action shortening; bolt work; sight installation; data on reheat treating M98 receivers and bolts for optimum use in custom sporting rifles, and much more. The effects of firing modern high pressure cartridges in small ring Mauser actions originally designed and barreled for cartridges in the approx. 37,000 to 40,000 psi range is included as a safety warning for those unfamiliar or in need of reminding. Photographs of sectioned receivers show receiver lug surface setback caused by firing 50,000+ psi cartridges in M93/95 Mauser actions with moderate and softer heat treats. Expanded edition - 224 pages with plastic laminated soft cover.